At Home with the Hinkleys: Snuggle Saturday Link Up!!! Here is the info, we really hope to see you next week! Welcome to Snuggle Saturday!!! 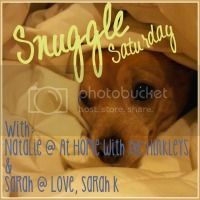 Sarah, at Love, Sarah K and I are pairing up and bringing you every Saturday, the Snuggle Saturday link up! We will be starting Snuggle Saturday Week 1, Saturday, January 19th. In honor of MLK weekend our theme/question is: If you could have dinner with one historical figure, who would you choose and why? See you next week for SNUGGLE SATURDAY! Love this idea! I'll be linking up when it starts! I'm a history buff so week one should be so fun for me! We're freaking cool! hahaha ~~ I'm trying to decide on my dinner too.. hmm hmm~~ and gosh what would I serve? Awesome idea for a link up!